August 16 is a day of reverence in France for the execution on that date in 1944 — just days ahead of the allied liberation of Paris — of 35 young Francs Tireurs partisans. In a dastardly operation, a French collaborator known as “Jacques” — actually Guy Glebe d’Eu, who was himself executed after the war — who had insinuated himself into resistance networks lured the youths, all aged about 18 to 22, to a purported weapons-smuggling operation. They were unarmed when they arrived, but the Gestapo was not. By nightfall the victims were being lined up at in the Bois de Boulogne and shot. 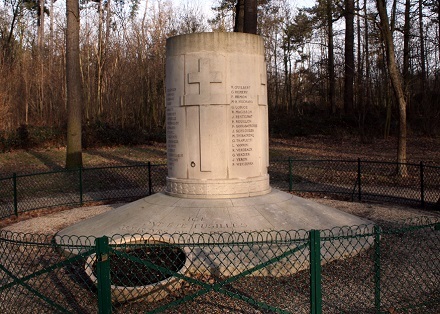 The site today is marked by a stately monument that hosts public memorials every August 16. (cc) image by Remi Jouan. 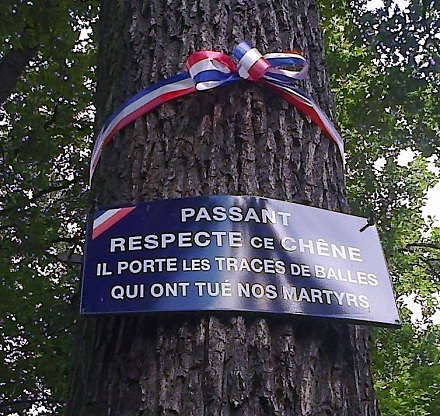 “Pass this oak with respect: it bears the scars of the balls that slew our martyrs.” (cc) image by Mickael Denet.